Double-pocket mesh bags are a great value! 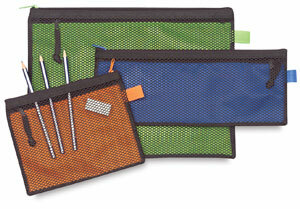 They carry just about any accessory you can imagine and will keep you organized. Each bag is made out of mesh nylon and includes durable nylon zippers. The zippered inside pouch keeps tiny items protected. It is also a safe haven for personal items.